Chronic obstructive pulmonary disease is mainly triggered by cigarette smoke (CS) and progresses even after smoking cessation. CS induces an exaggerated influx of inflammatory cells to the bronchoalveolar space and lung parenchyma, likely resulting from a complex interplay between chemoattractants and their respective receptors. In a murine CS model of chronic obstructive pulmonary disease, we studied the importance of chemokine-like receptor ChemR23 for the induction and resolution of inflammation in CS-exposed lungs. Subacute and chronic CS exposure increased protein levels of the ChemR23 ligand and chemoattractant, chemerin, in bronchoalveolar lavage (BAL) fluid of wild-type (WT) mice. 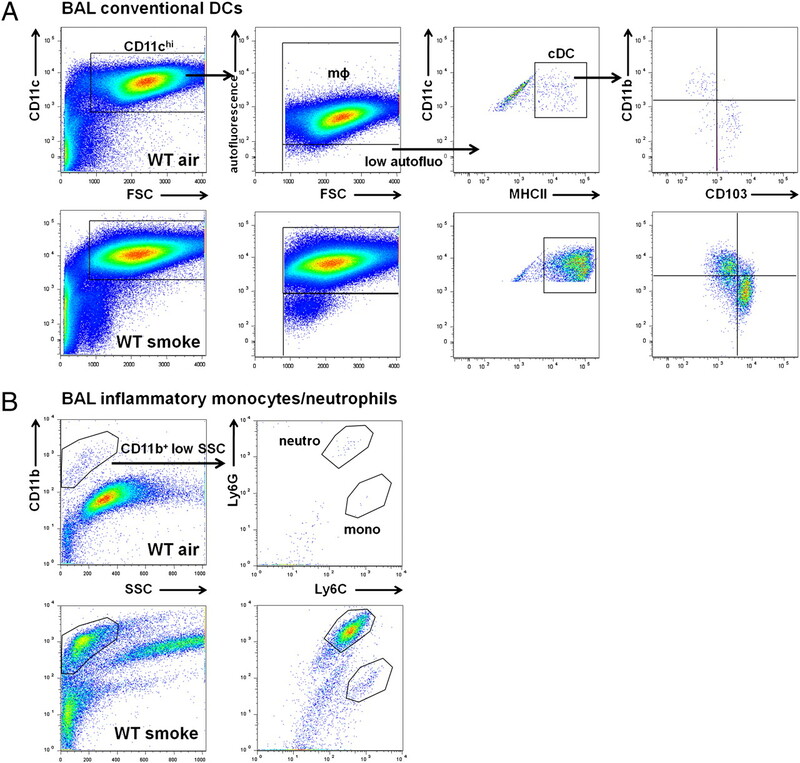 Moreover, the proinflammatory chemokines CXCL1, CCL2, and CCL20 were increased in the airways of CS-exposed WT mice, accompanied by a massive accumulation of inflammatory neutrophils and monocytes, CD11bhiCD103− and CD11bloCD103+ dendritic cells (DCs), and CD4+ and CD8+ T cells. The lung parenchyma of WT mice was infiltrated with inflammatory neutrophils, CD11bhiCD103− DCs, and activated CD4+ T cells after CS exposure. 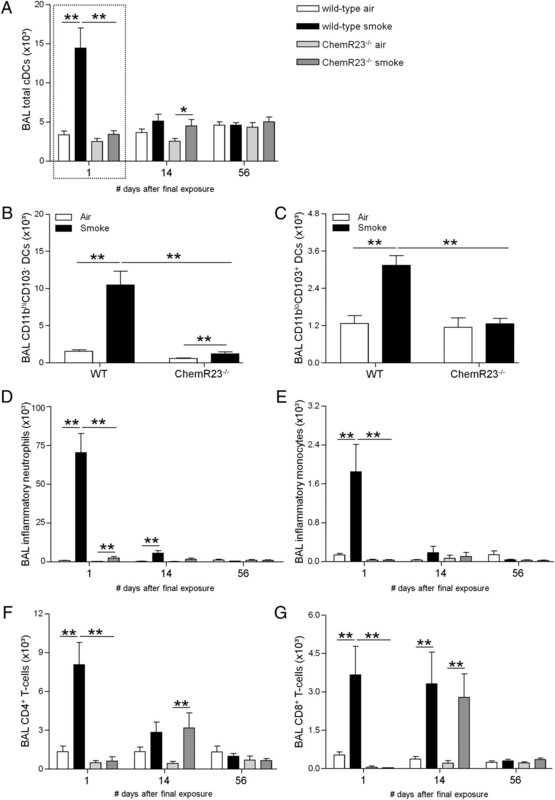 CS-induced inflammation was severely attenuated in BAL fluid and lungs of ChemR23 knockout mice with regard to the induction of inflammatory chemokines and the recruitment of inflammatory cells. 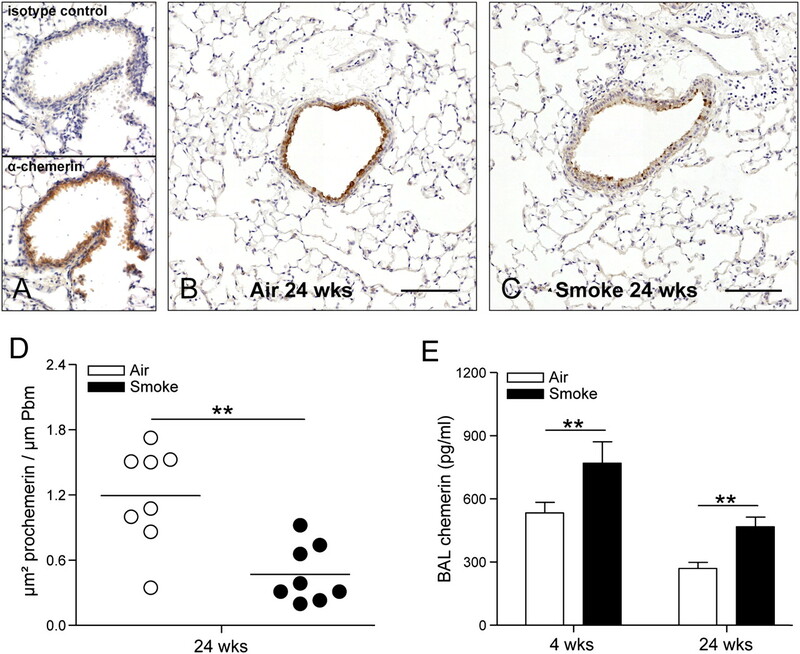 Neutrophils and CD8+ T cells persisted in the airways of WT mice, as did the airway-derived conventional DCs in the mediastinal lymph nodes, for at least 14 d after smoking cessation. In the BAL fluid of CS-exposed ChemR23 knockout mice, there was a remarkable delayed accumulation of T cells 14 d after the final exposure. Our data support a role for ChemR23 in directing innate and adaptive immune cells to CS-exposed lungs. Chronic obstructive pulmonary disease (COPD) is mainly caused by cigarette smoking and characterized by chronic inflammation and poorly reversible airflow limitation. Even though COPD is generally a treatable and preventable disease, many of the underlying pathogenetic mechanisms remain unknown. Moreover, COPD progresses even after smoking cessation. In addition, persisting exposure to risk factors such as cigarette smoke (CS) and the aging of the global population are predicted to increase the already high incidence and socioeconomic burden of COPD in the next decades (1, 2). A complex challenge in elucidating the COPD pathogenesis consists of identifying the ligand–receptor axes, which are involved in the accumulation of inflammatory cells in the airways and lung parenchyma, triggered by CS exposure. Binding of chemoattracting cytokines (chemokines) to chemokine receptors is a well-conserved system, reported to be important for the recruitment of innate and adaptive immune cells to diseased lungs in both patients with COPD (3) and murine smoke models of COPD (4, 5). We and others have demonstrated that mice deficient for CCR5 and -6 are only partially protected against CS-induced pulmonary inflammation (4–6), suggesting the involvement of additional chemoattractant receptors in the recruitment of inflammatory cells to CS-exposed lungs. Recently, a novel G-protein–coupled seven-transmembrane receptor, ChemR23, was identified on monocytes/macrophagess, immature conventional dendritic cells (cDCs), plasmacytoid DCs (pDCs), and NK cells in humans and mice (7–9). Because of its strong resemblance to chemoattractant receptors, ChemR23 (also referred to as chemokine-like receptor 1) was suspected to direct chemotaxis upon its discovery (7). Accordingly, the protein chemerin, identified in inflammatory fluids and inflamed tissues, was suggested to specifically attract monocytes/macrophages and immature DCs to inflammation-targeted sites via ChemR23 signaling (8, 10, 11). Chemerin is widely expressed throughout the body in epithelium (9) and endothelium (8), but also in fibroblasts (12), adipocytes (13), and keratinocytes (8). Chemerin is synthesized as preprochemerin and secreted as poorly active prochemerin, gaining full bioactivity as a ligand for ChemR23 after C-terminal cleavage of 6 to 7 aa (9, 14, 15). Active chemerin is increased in several inflammatory secretions that are enriched in inflammatory cell-derived proteases such as neutrophil elastase and mast cell tryptase. In addition to chemerin, the anti-inflammatory lipid resolvin E1, derived from the ω-3 fatty acid eicosapentaenoic acid, also binds to ChemR23 (16). Interestingly, resolvin E1–ChemR23 interaction could favor inflammation resolution by inhibiting the activation of NF-κB, a transcription factor that can be activated by CS components in both inflammatory and structural cells of the lung (17, 18). These findings prompted us to study the involvement of ChemR23 in CS-induced COPD. cDCs and monocytes/macrophages (ChemR23+ cells) and neutrophils (chemerin processors) are increased in lungs of patients with COPD and CS-exposed mice. Moreover, the irreversible nature of COPD points toward impaired resolution of inflammation. Therefore, we hypothesized that an imbalance between pro- and anti-inflammatory ChemR23 signaling directs the CS-induced response toward inflammation and the suppression of resolution. Using a murine model of COPD, we revealed the role of ChemR23 in CS-induced inflammation. First, we characterized the expression of chemerin and ChemR23 in lungs of wild-type (WT) mice after subacute (4 wk) or chronic (24 wk) exposure to air or CS. Second, we investigated the inflammatory response upon subacute CS exposure in WT versus ChemR23 knockout (ChemR23−/−) mice in different anatomic compartments (airway lumen, lung tissue, and mediastinal lymph nodes). Third, we monitored the resolution of CS-induced inflammation in these three compartments on days 1, 14, and 56 after the final CS exposure. Male C57BL/6 WT controls (6–8 wk old) and homozygous C57BL/6 ChemR23−/− mice (9) (6–8 wk old), originally developed by Deltagen, were obtained via Charles River Laboratories. All mice were housed in sterilized cages with filter tops and received food and water ad libitum. The local Ethics Committee for animal experimentation of the Faculty of Medicine and Health Sciences (Ghent University, Ghent, Belgium) approved all in vivo manipulations. Male mice (n = 8 per group) were exposed to CS, as described previously (19). Briefly, groups of eight mice were exposed whole body to the tobacco smoke of five cigarettes (Reference Cigarette 3R4F without filter; University of Kentucky, Lexington, KY) four times a day with 30-min smoke-free intervals, 5 d/wk for 4 wk (subacute exposure) or 24 wk (chronic exposure). During the exposure, an optimal smoke/air ratio of 1:6 was obtained. The control groups were exposed to air. Carboxyhemoglobin in serum of smoke-exposed mice reached a nontoxic level of 8.7 ± 0.31% (compared with 0.65 ± 0.25% in air-exposed mice; n = 4 for both groups), similar to carboxyhemoglobin blood concentrations of human smokers (20). One, 14, or 56 d after the last exposure, mice were weighed and euthanized with an overdose of pentobarbital (Sanofi, Libourne, France), and a cannula was inserted in the trachea. A total of 3 × 300 μl, followed by 3 × 1 ml HBSS, free of ionized calcium and magnesium, but supplemented with 0.05 mM sodium EDTA, was instilled via the tracheal cannula and recovered by gentle manual aspiration. The six lavage fractions were pooled and centrifuged, and the cell pellet was washed twice and finally resuspended in 1 ml HBSS. The total cell count was performed in a Bürker chamber, and differential cell counts (on at least 400 cells) were performed on cytocentrifuge preparations using standard morphologic criteria after May-Grünwald-Giemsa staining. Flow cytometric analysis of bronchoalveolar lavage (BAL) cells was performed to enumerate monocytes, neutrophils, DC subsets, and T lymphocytes. After rinsing of pulmonary and systemic circulation, the left lung was used for histology and the right lung for the preparation of a single-cell suspension (19). Mediastinal lymph nodes were removed and digested, as described previously (21). Briefly, lungs and lymph nodes were thoroughly minced, digested, subjected to RBC lysis, and finally passed through a 50-μm cell strainer. Cell counting was performed with a Z2 Beckman Coulter particle counter (Beckman Coulter, Ghent, Belgium). Cells were preincubated with FcR-blocking Ab (anti-CD16/CD32, clone 2.4G2) to reduce nonspecific binding. The following mAbs were used to identify mouse DC populations: anti-CD11c (HL3), anti–I-Ab (AF6-120.1), anti-CD11b (M1/70), anti-CD103 (M290), and anti-pDC Ag-1 (PDCA-1) (JF05-1C2.4.1). We discriminated between macrophages and DCs using the methodology described by Vermaelen and Pauwels (22). After gating on the CD11c-bright population, two peaks of autofluorescence can be distinguished. The macrophages were identified as the CD11c-bright, high-autofluorescent population, with a low to absent expression of MHC class II (MHCII). DCs were identified as CD11c-bright, low-autofluorescent cells, which strongly express MHCII. DCs enumerated by these criteria correspond with cDCs, encompassing two major populations in the lung: CD11bhiCD103− and CD11bloCD103+ DCs. In the lymph nodes, we distinguished the CD11cmed-hi/MHCIIhi airway-derived DCs from the CD11chi/MHCIImed non–airway-derived DCs. pDCs were characterized as PDCA-1+ cells within the low-autofluorescent CD11cmed/MHCIImed/lo population (23). Monocyte and neutrophil populations were studied with anti-CD11c, anti-CD11b, anti-Ly6G (1A8), and anti-Ly6C (AL-21). Inflammatory monocytes were defined as CD11c−CD11b+Ly6ChiLy6G− and inflammatory neutrophils as CD11c−CD11b+Ly6CmedLy6Ghi. The following mAbs were used to stain mouse T cell subpopulations: anti-CD4 (GK1.5), anti-CD8 (53-6.7), and anti-CD3 (145-2C11). Anti-CD69 (H1.2F3) was included as a marker for early T cell activation. With the exception of anti–PDCA-1 (Miltenyi Biotec) and anti-CD11b (Biolegend), all Abs were obtained from BD Pharmingen. In a last step before analysis, cells were incubated with 7-aminoactinomycin D (BD Pharmingen) to check cell viability. All labeling reactions were performed on ice in FACS-EDTA buffer. Flow cytometry data acquisition was performed on an FACSCalibur and a BD LSRII running CellQuest and FACSDiva software (BD Biosciences). FlowJo software (Tree Star) was used for data analysis. Following incubation with anti-CD11c microbeads (Miltenyi Biotec), CD11c+ cells were purified from the total lung single-cell suspension by passage through a VarioMACS magnetic cell separator (Miltenyi Biotec). Subsequently, cDCs versus macrophages were sorted using anti-CD11c, anti-MHCII, and the gating strategy detailed above on an FACSVantage with a Sort Enhancement Module (24). Using this strategy, we obtained for the cDCs a cell purity of 90.1 and 92.9% in air- and CS-exposed lungs, respectively. For the macrophage population, a purity of 96.1 and 97.6% was reached in air- and CS-exposed lungs, respectively. The left lung was fixated by intratracheal infusion of fixative (4% paraformaldehyde), as described previously (19). After excision, the lung was immersed in fresh fixative during 2 h. The lung lobe was embedded in paraffin and cut into 3-μm transversal sections. Photomicrographs were captured using a Zeiss KS400 image analyzer platform (KS400; Zeiss, Oberkochen, Germany). Sections obtained from formalin-fixed, paraffin-embedded lung lobes were stained for chemerin. Following treatment with Ultra V Block (Labvision, Fremont, CA), sections were incubated with polyclonal anti-mouse chemerin Ab (R&D Systems, Minneapolis, MN). This anti-chemerin Ab is produced by immunization of goats with recombinant mouse chemerin (aa 17–156) and recognizes both active and inactive chemerin forms (including prochemerin). The Goat HRP-Polymer Kit (Biocare Medical, Concord, CA) and diaminobenzidine (DakoCytomation, Glostrup, Denmark) were used for detection. Prochemerin staining was quantified within the airway epithelium in a marked area between the airway lumen and the basement membrane, using KS400 software (Zeiss). The area with positive staining for prochemerin was normalized to the length of the basement membrane (Pbm). All airways with a Pbm <2000 μm and cut in reasonable cross sections were included. Total levels of secreted chemerin (active and inactive forms) were determined in BAL fluid, using a commercially available ELISA kit (R&D Systems). Protein levels of CXCL1 (keratinocyte-derived chemokine), CCL2 (monocyte chemotactic protein 1), and CCL20 (macrophage inflammatory protein 3α) were determined in BAL fluid using commercially available ELISA kits (R&D Systems). RNA was extracted from total lung and pulmonary cell subsets with the RNeasy Mini Kit (Qiagen, Hilden, Germany). RT-PCR results were obtained via absolute quantification, relating the PCR signal to a standard curve. Expression of preprochemerin and ChemR23 mRNA was determined relative to GAPDH mRNA, using previously described primer sequences. RT-PCR was performed on a LightCycler 480 Instrument (Roche Diagnostics, Basel, Switzerland) with murine leukemia virus RTase (Applied Biosystems). RT-PCR was performed at 42°C for 30 min, followed by 10 min incubation at 95°C for denaturation of RNA-DNA heteroduplexes, and 45 cycles of 95°C for 15 s and 62°C for 1 min. Monitoring of the RT-PCR occurred in real time using FAM/DABSYL probe. All reactions were performed starting from 10 ng total RNA. Reported values are expressed as mean ± SEM. Statistical analysis was performed with Sigma Stat software (SPSS 15.0; SPSS, Chicago, IL) using nonparametric tests (Kruskall–Wallis; Mann–Whitney U). A p value <0.05 was considered significant. We first investigated whether CS exposure affects mRNA expression of chemerin and ChemR23 in total lung tissue (Fig. 1). Both preprochemerin (Fig. 1A) and ChemR23 (Fig. 1B) mRNA were significantly downregulated in total lung upon subacute and chronic CS exposure. mRNA expression of preprochemerin and ChemR23 in lungs of WT mice upon subacute (4 wk) or chronic (24 wk) exposure to air or CS. mRNA levels of preprochemerin (A) and ChemR23 (B) in total lung, as measured by RT-PCR. Results are expressed as ratio with GAPDH mRNA (mean ± SEM). n = 5 animals/group. Data are representative of two independent experiments. ChemR23 mRNA expression in different pulmonary cell subsets (C) sorted by flow cytometry: CD11c− cells, cDC (low-autofluorescent CD11chiMHCII+), and macrophages (mϕ; high-autofluorescent CD11chi). Single-cell suspensions of eight animals were pooled prior to cell sorting and mRNA extraction. *p < 0.05, **p < 0.01. Aiming to further characterize the cells expressing ChemR23, we determined ChemR23 mRNA expression in different pulmonary cell subsets, including CD11c− cells, cDCs, and macrophages, sorted by flow cytometry (Fig. 1C). Unexpectedly, the CD11c− cell population, depleted from cDCs and macrophages, emerged as a major source of ChemR23, whereas ChemR23 mRNA was minimal in macrophages. Moreover, CD11c− cells approximately contained 6-fold and 100-fold more ChemR23 mRNA than cDCs and macrophages, respectively. Corresponding with total lung, ChemR23 mRNA expression tended to decrease in cDCs and CD11c− cells upon subacute CS exposure. Next, we localized and measured chemerin protein in lungs of air-versus CS-exposed WT mice (Fig. 2). Using immunohistochemistry, we revealed the airway epithelium as the predominant source of chemerin in the lung (Fig. 2A–C). Prochemerin was abundantly present on the luminal side of the airway epithelium, but not in the endothelium. Using imaging software, we quantified the prochemerin-positive staining in the airways (Fig. 2D). Subacute CS exposure did not change the amount of prochemerin in the airway epithelium (data not shown). After chronic CS exposure, however, prochemerin protein was clearly decreased within the epithelium (Fig. 2B, 2C). Chemerin protein expression in airways and lungs of WT mice upon subacute (4 wk) or chronic (24 wk) exposure to air or CS. A, Immunohistochemical staining for chemerin was performed using goat α-mouse chemerin IgG (R&D Systems). Photomicrographs of lung sections show the presence of prochemerin in the airway epithelium of chronic air-exposed (B) and CS-exposed (C) WT mice. Original magnification ×100. Scale bars, 100 μm. D, Quantification of prochemerin in the airway epithelium of WT mice after chronic exposure to air or CS. Results are expressed as the epithelial area positive for prochemerin, normalized for the basement membrane length (Pbm). Mean ± SEM, n = 8 animals/group. E, Total secreted chemerin levels in BAL fluid, measured by ELISA. Results are expressed as picograms per milliliter; mean ± SEM. Data are representative of two independent experiments. **p < 0.01. Interestingly, both subacute and chronic CS exposure increased the levels of total secreted chemerin in the BAL fluid of smoking WT mice, as measured by ELISA (Fig. 2E). Because ChemR23 is implicated in the chemotaxis of monocytes/macrophages and immature DCs to inflamed chemerin-expressing sites (8, 11), we hypothesized a role for the chemerin-ChemR23 axis in the CS-induced recruitment of inflammatory cells to the airways and lungs. Therefore, we analyzed CS-induced inflammation in BAL fluid and lungs of WT versus ChemR23−/− mice, 1 d after the final exposure (Figs. 3, 4, left panels) using the gating strategy in Figs. 5 and 6. Cell differentiation in the BAL fluid of WT and ChemR23−/− mice on days 1, 14, and 56 after subacute exposure to air or CS. 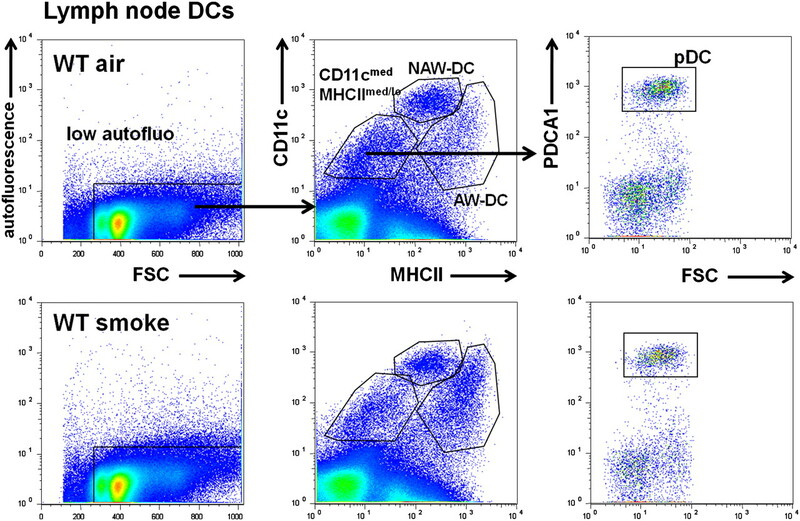 Cell subsets enumerated by flow cytometry include: total cDCs (A), CD11bhiCD103− DCs (B), CD11bloCD103+ DCs (C), inflammatory neutrophils (CD11c−CD11b+Ly6CmedLy6Ghi) (D), inflammatory monocytes (CD11c−CD11b+Ly6ChiLy6G−) (E), CD4+ T cells (F), and CD8+ T cells (G). Results are expressed as absolute cell numbers, mean ± SEM. n = 8 animals/group. Data on day 1 postexposure are representative of two independent experiments. *p < 0.05, **p < 0.01. Cell differentiation in lungs of WT and ChemR23−/− mice on days 1, 14, and 56 after subacute exposure to air or CS. Total cDCs (A), CD11bhiCD103− DCs (B), CD11bloCD103+ DCs (C), pDCs (D), inflammatory neutrophils (CD11c−CD11b+Ly6CmedLy6Ghi) (E), CD4+CD69+ T cells (F), and CD8+CD69+ T cells (G), enumerated by flow cytometry. Results are expressed as absolute cell numbers, mean ± SEM. n = 8 animals/group. Data on day 1 postexposure are representative of two independent experiments. *p < 0.05, **p < 0.01. Flow cytometric analysis of cell populations in the BAL fluid. A, Gating strategy for the characterization of cDCs upon exposure to air or CS: cDCs are identified as CD11chi, low-autofluorescent cells that strongly express MHCII (CD11chi, high-autofluorescent cells are marked as macrophages [mϕ]). cDCs in BAL fluid mainly encompass CD11bhiCD103− and CD11bloCD103+ DCs. B, Gating strategy for the characterization of inflammatory monocytes and neutrophils upon exposure to air or CS: within the CD11b+ population with low side scatter, inflammatory monocytes were defined as CD11c−Ly6ChiLy6G− cells and inflammatory neutrophils as CD11c−Ly6CmedLy6Ghi cells. Flow cytometric analysis of DC populations in the lung. A, Gating strategy for the characterization of cDCs upon exposure to air or CS: cDCs are identified as CD11chi, low-autofluorescent cells that strongly express MHCII (CD11chi, high-autofluorescent cells are marked as macrophages [mϕ]). cDCs in the lung mainly encompass CD11bhiCD103− and CD11bloCD103+ DCs. B, Gating strategy for the characterization of pDCs upon exposure to air or CS: pDCs were gated as PDCA-1+ cells within the low-autofluorescent CD11cmed/MHCIImed/lo population. In BAL fluid of WT mice, subacute CS exposure increased inflammatory neutrophils and monocytes, total cDCs (including the CD11bhiCD103− and CD11bloCD103+ subset), and CD4+ and CD8+ T cells (Fig. 3). In contrast, this inflammatory response was severely attenuated in the BAL fluid of ChemR23−/− mice. Similarly, subacute CS exposure increased inflammatory neutrophils, total cDCs (including the CD11bhiCD103− subset), and activated CD4+ T cells in lungs of WT mice, but not in ChemR23−/− mice (Fig. 4A, 4B, 4E, 4F). Reportedly, ChemR23 also directs chemotaxis of pDCs to inflamed skin in response to chemerin. Therefore, we defined and determined pDCs in the lung as CD11cmedMHCIImed/loPDCA-1+ cells (23). After subacute CS exposure, we observed a decrease in pulmonary pDCs in lungs of both WT and ChemR23−/− mice (Fig. 4D). To better understand the apparent hampered recruitment of inflammatory cells to the airways of CS-exposed ChemR23−/− mice, we measured protein levels of inflammatory chemokines, previously shown to be increased in the BAL fluid of smoking mice (Fig. 7). Inflammatory chemokines in the BAL fluid of WT and ChemR23−/− mice on days 1, 14, and 56 after subacute exposure to air or CS. CCL2 (A), CXCL1 (B), and CCL20 (C) protein levels, measured by ELISA. Results are expressed as picograms per milliliter, mean ± SEM. n = 8 animals/group. Data on day 1 postexposure are representative of two independent experiments. *p < 0.05, **p < 0.01, ***p < 0.001. CCL 2 (CCL2), CXCL 1 (CXCL1), and CCL 20 (CCL20), respectively attracting mainly monocytes, neutrophils and cDCs/T cells, were significantly increased in BAL fluid of CS-exposed WT mice compared with air-exposed controls. In contrast, the CS-induced chemokine response was severely attenuated in ChemR23−/− mice. The results above indicate a probable involvement of ChemR23 in CS-induced recruitment of cDCs to the airways and lungs. In addition, we monitored cDC migration from the airways to the draining (mediastinal) lymph nodes in WT versus ChemR23−/− mice (Fig. 8), because this event occurs secondary to myeloid DC recruitment to the lung and is greatly amplified upon CS exposure (23). We distinguished between airway-derived and non–airway-derived cDCs using a previously described method (21) (Fig. 9). DCs in mediastinal lymph nodes of WT and ChemR23−/− mice after subacute exposure to air or CS. Airway-derived cDCs (A, B), non–airway-derived cDCs (C, D), and pDCs (E, F) on days 1, 14, and 56 postexposure, enumerated by flow cytometry. Results are expressed as percentage of total cells, mean ± SEM. n = 8 animals/group. Data on day 1 postexposure are representative of two independent experiments. *p < 0.05, **p < 0.01. Flow cytometric analysis of DC populations in the mediastinal lymph nodes. Gating strategy for the characterization of conventional and pDCs upon exposure to air or CS: within the low-autofluorescent population, we distinguished the CD11cmed-hi/MHCIIhi airway-derived DCs (AW-DCs) from the CD11chi/MHCIImed non–airway-derived DCs (NAW-DCs). pDCs were characterized as PDCA-1+ cells within the low-autofluorescent CD11cmed/MHCIImed/lo population. Subacute CS exposure significantly increased airway-derived cDCs in lymph nodes of WT mice for up to 14 d postexposure (Fig. 8A). In contrast, subacute CS exposure did not change the percentage of airway-derived cDCs in ChemR23−/− mice (Fig. 8B). Importantly, non–airway-derived cDC numbers were not affected by CS exposure in lymph nodes of both WT and ChemR23−/− mice (Fig. 8C, 8D). Because ChemR23 has the potential to promote lymph node entry of immature pDCs via chemerin-expressing high endothelial venules (11), we determined pDCs in the mediastinal lymph nodes of WT and ChemR23−/− mice (Fig. 8E, 8F). pDC numbers were not impaired in the absence of ChemR23. Similar to the lung, subacute CS exposure reduced pDCs in lymph nodes of both WT and ChemR23−/− mice; however, pDC numbers were normalized in mice of both genotypes by day 14 after the final CS exposure. 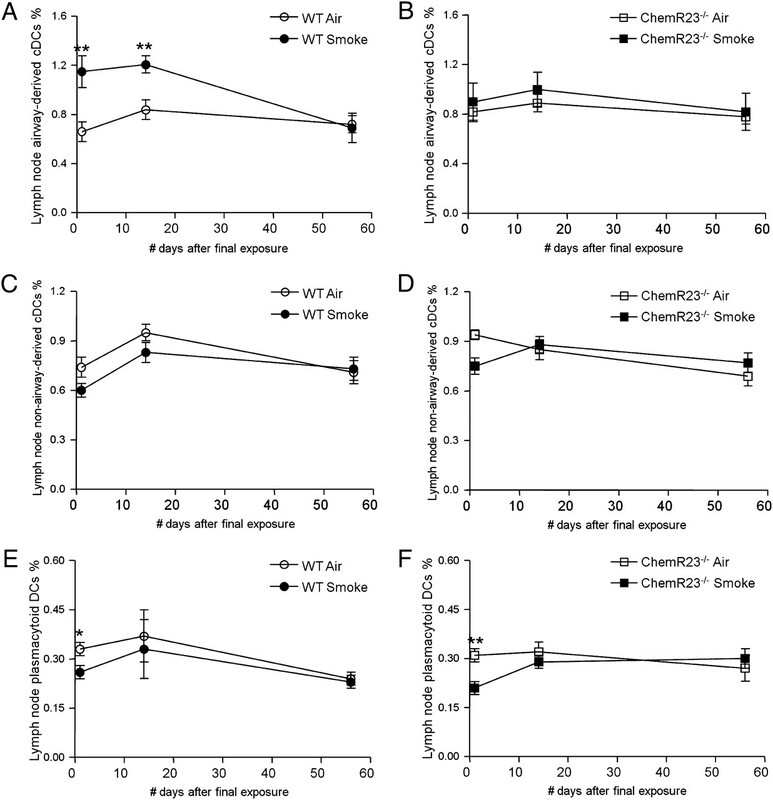 To determine a possible contribution of ChemR23 to the resolution of CS-induced inflammation, we also set out to analyze inflammatory cell accumulation in BAL fluid, lungs, and mediastinal lymph nodes of WT and ChemR23−/− mice on days 14 and 56 following subacute exposure to air or CS (Figs. 3, 4, 8). CS-induced inflammation was significantly resolved in BAL fluid of WT mice on day 14 postexposure, except for a notable persistence in neutrophils and CD8+ T cells (Fig. 3D, 3G), which was accompanied by elevated levels of CXCL1 and CCL20 (Fig. 7B, 7C). Whereas pulmonary inflammatory neutrophils persisted (Fig. 4E), cDC and CD4+CD69+ T cell numbers were normalized in lungs of WT mice by day 14 after the final CS exposure (Fig. 5A, 4F). By day 56 postexposure, there was complete clearance of inflammatory cells in the airways and lungs of CS-exposed mice. BAL fluid levels of the inflammatory chemokines CCL2, CXCL1, and CCL20 declined accordingly and were fully restored to normal by day 56 postexposure (Fig. 7). Whereas the inflammatory response was minimal in ChemR23−/− mice on day 1 after the final CS exposure, there was a remarkable delayed accumulation of T cells in the BAL fluid of ChemR23−/− mice on day 14 post-CS exposure (Fig. 3F, 3G). Given our observation that CS exposure affects the pulmonary expression of chemerin and ChemR23 in WT mice, we set out to determine the role of ChemR23 signaling in both CS-induced pulmonary inflammation as well as the resolution of inflammation upon smoking cessation. We observed a remarkably reduced accumulation of inflammatory cells and chemokines in lungs of CS-exposed ChemR23−/− mice compared with WT mice. In contrast, steady-state and CS-induced numbers of pDCs in the lungs and mediastinal lymph nodes were not affected by the ChemR23 deficiency. Upon smoking cessation, neutrophils and CD8+ T cells notably persisted in the airways of WT mice for at least 14 d, as did the airway-derived cDCs in the mediastinal lymph nodes. The release of proinflammatory mediators by the airway epithelium is one of the earliest events directing the recruitment of innate immune cells to CS-exposed airways (25). We observed in the BAL fluid of CS-exposed WT mice an increase in secreted chemerin, a known chemoattractant for monocytes/macrophages and immature DCs. Immunohistochemistry revealed the airway epithelium, but not the endothelium, as a major source of chemerin in the lung. Prochemerin was predominantly localized on the luminal side of the epithelium, available for secretion. Elevated levels of total secreted chemerin in the airway lumen together with a downregulation of preprochemerin mRNA in the lung could explain the apparent depletion of prochemerin protein in CS-exposed airway epithelium. CS exposure may thus induce the release of prochemerin in the airways and favor its proteolytic activation by inflammatory cell-derived proteases such as neutrophil elastase and cathepsin G, both proven activators of chemerin (15). After proteolytic activation, chemerin can attract innate immune cells to the airway lumen via the chemotactic receptor ChemR23, which has been identified on monocytes and immature cDCs. Both inflammatory monocytes and cDCs accumulated strongly in the airways of CS-exposed WT mice. Conversely, ChemR23−/− mice were largely impaired in their recruitment of cDCs to the airways and lung parenchyma upon CS exposure. First, cDCs may not have increased due to a lack of available DC precursors/monocytes. Indeed, the attenuated recruitment of CD11bhiCD103− DCs in ChemR23−/− mice could be partially attributed to lower numbers of inflammatory monocytes, the precursor cells for a proportion of the CD11bhi DC subset. Second, the significant expression of ChemR23 mRNA in pulmonary cDCs suggests the receptor can also be directly involved in the CS-induced recruitment of lung DCs to the airway lumen. In the mediastinal lymph nodes of CS-exposed mice, airway-derived cDCs increase secondary to the CS-induced recruitment of cDCs or their precursors from the circulation into the lung. Accordingly, CS-exposed ChemR23−/− mice did not have increased numbers of airway-derived cDCs in their lung draining lymph nodes. In addition, the absence of ChemR23 unexpectedly interfered with the CS-induced recruitment of neutrophils and T cells, cell types that do not express ChemR23. Therefore, the dampened CS-induced pulmonary inflammation in ChemR23−/− mice may also be explained by the impaired expression of the proinflammatory chemokines CXCL1, CCL2, and CCL20, which mainly attract neutrophils, monocytes, and cDCs/T cells, respectively. Pulmonary CD11bhi DCs, important producers of the above-mentioned chemokines (26), were indeed poorly increased in the airways and lungs of CS-exposed ChemR23−/− mice. However, the airway epithelium should not be overlooked as additional source of CXCL1 (25, 27), CCL2 (27), and CCL20 (28), and the epithelium may be altered in ChemR23−/− mice. Alternatively, ChemR23 signaling could be required for the CS-induced upregulation of epithelium-derived chemokines. The pronounced ChemR23 mRNA expression in lungs depleted from cDCs and macrophages is suggestive of ChemR23-expressing structural lung cells. Upon C-terminal cleavage of prochemerin, the nature of the executing protease is determining for the function of the chemerin isoform (29). Neutrophils, for instance, have the ability to generate both activate and inactivate forms of chemerin via the secretion of, respectively, cathepsin G, elastase (15), and proteinase 3 (30), whereas activated macrophages could release proteases that generate anti-inflammatory chemerin (31). Such proteolytic regulation of chemerin activity is consistent with recent studies attributing an anti-inflammatory role to chemerin and chemerin-derived peptides in mouse models of acute lung injury (9) and peritonitis (32), respectively. In our smoke model, we observed an attenuated recruitment of inflammatory cells in CS-exposed ChemR23−/− mice compared with WT mice, which is consistent with chemoattractive and proinflammatory chemerin–ChemR23 signaling. Nevertheless, we cannot rule out the generation of inactivated or anti-inflammatory chemerin upon prolonged CS exposure. The resolution of CS-induced inflammation in mice is understudied. Neutrophils and lymphocytes have been reported to persist in lungs of chronic CS-exposed mice after smoking cessation (33, 34). Remarkably, our data in WT mice show that subacute CS exposure sufficed to sustain neutrophilic inflammation and elevated levels of the neutrophil attractant CXCL1 in the lung, for at least 2 wk after smoking cessation. According to a recent report, chronic CS exposure itself can cause a persistent adaptive T cell immune response (35). In our model, the initial CS-induced increase in pulmonary T cells probably reflects the nonspecific inflammatory recruitment of effector memory T cells via CCL20–CCR6 signaling. However, for at least 2 wk into the resolution phase, airway-derived DCs persisted in the draining lymph nodes of CS-exposed WT mice, notably accompanied by a strong accumulation of CD8+ T cells in the airway lumen. At this point, effector T cells, generated in the draining lymph nodes upon CS exposure and recruited to the lung, may comprise the majority of T cells in the airways. As such, the delayed increase in CD4+ and CD8+ T cells in the airways of ChemR23−/− mice, 2 wk post-CS exposure, was not accompanied by elevated CCL20 levels and may thus represent the recruitment of effector T cells in a CCR6-independent manner. ChemR23 may be important for the resolution of CS-induced inflammation via binding of resolvin E1. 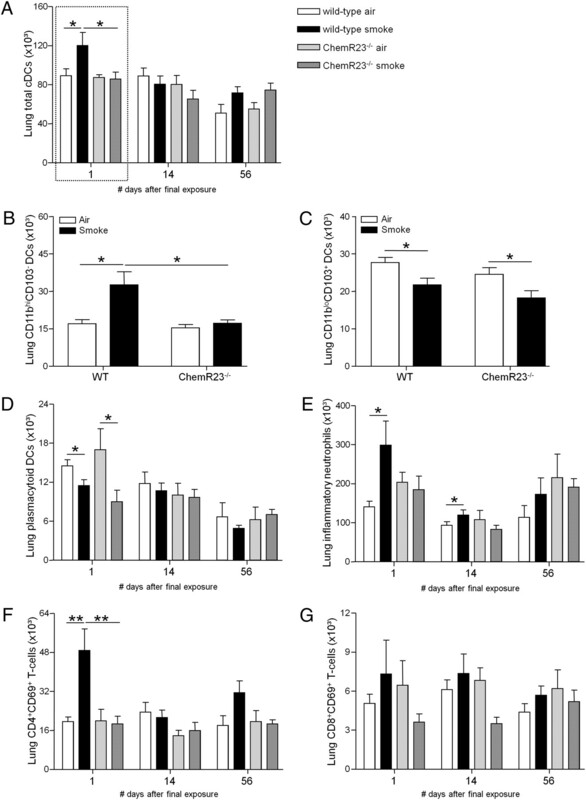 However, because of the strong protective effect of ChemR23 deficiency against subacute CS-induced inflammation, it was difficult to monitor inflammation resolution in ChemR23−/− mice. Moreover, the in vivo proresolving effects of resolvin E1 could also be explained by its interaction with the leukotriene B4 receptor 1 (36), expressed by neutrophils and macrophages. Ideally, ChemR23 expression or function should be inactivated upon smoking cessation, after full-blown inflammation has been triggered, for instance, by administering a ChemR23 antagonist. Our data on decreased pDCs in lungs and draining lymph nodes of CS-exposed mice confirm previous findings (23) and are suggestive of increased susceptibility to viral infections and decreased immune tolerance in smokers. ChemR23 is one of the few chemotactic receptors directing the migration of pDCs to the lymph nodes and inflamed peripheral sites (11, 12). However, pulmonary and lymph node pDC numbers did not differ between WT and ChemR23−/− mice in the steady state or after CS exposure. Studies on the expression of ChemR23 on murine pDCs have generated conflicting results (9, 37). Furthermore, in addition to ChemR23, CXCR4 has been shown to direct the migration of pDCs (38). Alternatively, the decrease in pDCs may not represent altered recruitment, but could be the result of CS-induced maturation and differentiation of this immature DC subset into cDCs (39). Finally, the CS-induced reduction of pDCs could also result from a defect in available circulating pDCs or their precursors (40). In summary, targeting of ChemR23 may be of therapeutic interest, considering its apparent involvement in the initial recruitment of inflammatory cells and the expression of proinflammatory mediators in CS-exposed lungs, most likely in response to the enhanced local release and activation of its ligand chemerin. We thank Greet Barbier, Eliane Castrique, Indra De Borle, Philippe De Gryze, Katleen De Saedeleer, Anouck Goethals, Marie-Rose Mouton, Ann Neessen, Christelle Snauwaert, and Evelyn Spruyt (Department of Respiratory Medicine, Ghent University Hospital) for excellent technical assistance. This work was supported by the Concerted Research Action of Ghent University (BOF/GOA 01G01009; Ghent, Belgium), the Fund for Scientific Research Flanders (Project G.0195.09N; Brussels, Belgium), the Interuniversity Attraction Poles Program/Belgian State/Belgian Science Policy (P6/35; Brussels, Belgium), and Euroscreen S.A. (Brussels and Gosselies, Belgium). K.R.B. is a postdoctoral fellow of the Fund for Scientific Research Flanders.
. 2006. Chronic obstructive pulmonary disease: current burden and future projections. Eur. Respir. J. 27: 397–412.
. 2007. Global burden of COPD: risk factors, prevalence, and future trends. Lancet 370: 765–773.
. 2007. Accumulation of dendritic cells and increased CCL20 levels in the airways of patients with chronic obstructive pulmonary disease. Am. J. Respir. Crit. Care Med. 175: 998–1005.
. 2006. Cigarette smoke-induced pulmonary inflammation and emphysema are attenuated in CCR6-deficient mice. J. Immunol. 177: 4350–4359.
. 2007. Cigarette smoke-induced pulmonary inflammation, but not airway remodelling, is attenuated in chemokine receptor 5-deficient mice. Clin. Exp. Allergy 37: 1467–1479.
. 2005. Role of CCR5 in IFN-gamma-induced and cigarette smoke-induced emphysema. J. Clin. Invest. 115: 3460–3472.
. 1998. ChemR23, a putative chemoattractant receptor, is expressed in monocyte-derived dendritic cells and macrophages and is a coreceptor for SIV and some primary HIV-1 strains. Eur. J. Immunol. 28: 1689–1700.
. 2007. The role of chemerin in the colocalization of NK and dendritic cell subsets into inflamed tissues. Blood 109: 3625–3632.
. 2007. Chemerin is a novel adipokine associated with obesity and metabolic syndrome. Endocrinology 148: 4687–4694.
. 2004. The C-terminal nonapeptide of mature chemerin activates the chemerin receptor with low nanomolar potency. J. Biol. Chem. 279: 9956–9962.
. 2005. Stereochemical assignment, antiinflammatory properties, and receptor for the omega-3 lipid mediator resolvin E1. J. Exp. Med. 201: 713–722.
. 2006. Cigarette smoke induces proinflammatory cytokine release by activation of NF-kappaB and posttranslational modifications of histone deacetylase in macrophages. Am. J. Physiol. Lung Cell. Mol. Physiol. 291: L46–L57.
. 2002. Mechanism of cigarette smoke condensate-induced acute inflammatory response in human bronchial epithelial cells. Respir. Res. 3: 22.
. 2005. Time course of cigarette smoke-induced pulmonary inflammation in mice. Eur. Respir. J. 26: 204–213.
. 2004. Reduction of carboxyhaemoglobin levels in the venous blood of cigarette smokers following the administration of carbogen. Radiother. Oncol. 73: 367–371.
. 2001. Specific migratory dendritic cells rapidly transport antigen from the airways to the thoracic lymph nodes. J. Exp. Med. 193: 51–60.
. 2009. Concomitant inhalation of cigarette smoke and aerosolized protein activates airway dendritic cells and induces allergic airway inflammation in a TLR-independent way. J. Immunol. 183: 2758–2766.
. 2005. Matrix metalloproteinase-12 and cathepsin D expression in pulmonary macrophages and dendritic cells of cigarette smoke-exposed mice. Int. Arch. Allergy Immunol. 138: 169–179.
. 2008. Bronchiolar chemokine expression is different after single versus repeated cigarette smoke exposure. Respir. Res. 9: 7.
. 2007. 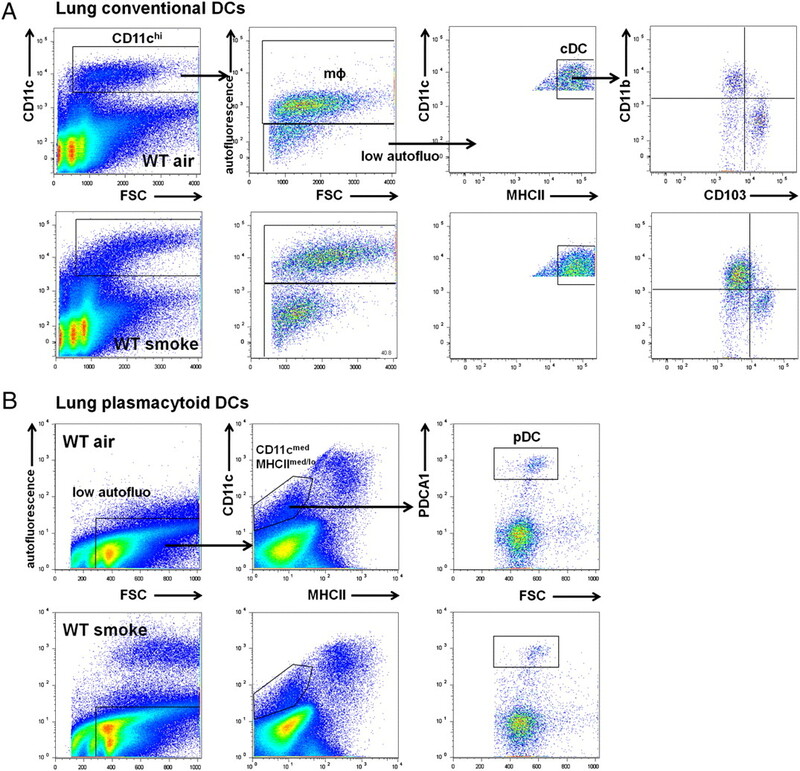 Diverse and potent chemokine production by lung CD11bhigh dendritic cells in homeostasis and in allergic lung inflammation. J. Immunol. 178: 1882–1895.
. 2005. Primary human alveolar type II epithelial cell CCL20 (macrophage inflammatory protein-3alpha)-induced dendritic cell migration. Am. J. Respir. Cell Mol. Biol. 32: 262–267.
. 2008. Chemerin reveals its chimeric nature. J. Exp. Med. 205: 2187–2190.
. 2009. Proteolytic regulatory mechanism of chemerin bioactivity. Acta Biochim. Biophys. Sin. (Shanghai) 41: 973–979.
. 2008. Synthetic chemerin-derived peptides suppress inflammation through ChemR23. J. Exp. Med. 205: 767–775.
. 2006. Modulators of cigarette smoke-induced pulmonary emphysema in A/J mice. Toxicol. Sci. 92: 545–559.
. 2010. Inflammatory changes in the airways of mice caused by cigarette smoke exposure are only partially reversed after smoking cessation. Respir. Res. 11: 99.
. 2008. Persistence of lung CD8 T cell oligoclonal expansions upon smoking cessation in a mouse model of cigarette smoke-induced emphysema. J. Immunol. 181: 8036–8043.
. 2007. Resolvin E1 selectively interacts with leukotriene B4 receptor BLT1 and ChemR23 to regulate inflammation. J. Immunol. 178: 3912–3917.
. 2006. Chemokine-like receptor 1 expression by macrophages in vivo: regulation by TGF-beta and TLR ligands. Exp. Hematol. 34: 1106–1114.
. 2001. Cutting edge: selective usage of chemokine receptors by plasmacytoid dendritic cells. J. Immunol. 167: 1862–1866.
. 2008. In vivo conversion of BM plasmacytoid DC into CD11b+ conventional DC during virus infection. Eur. J. Immunol. 38: 3388–3394.
. 2010. Imbalance of circulating dendritic cell subsets in chronic obstructive pulmonary disease. Clin. Immunol. 137: 102–110.